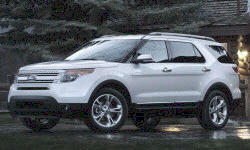 See TSBs and recalls for the 2013 Ford Explorer. US $100 The electrical button on the shifter goes bad and will not register being in park. The shifter was replaced under my extended warranty. US $130 Rear air was [not] blowing cold. It was found that the A/C Compressor was leaking. Evacuated system, flushed system, replaced A/C compressor, replaced A/C condenser, refilled system. Shifter button acting up again. When putting in park, would not always read in park, causing other issues. Shifter was replaced. US $100 Experienced driveline jolts when accelerating. Dealer said the jolts were due to driveline slack at the hub. Added a shim kit due to a TSB about the problem. 8000 mi Transmission shifting erratically. 14560 mi Air conditioning compressor failed. To be replaced, part on back order. Compressor Clutch and pulley worn out causing clutch to smoke when AC on. Evac recharge AC system. Replaced AC compressor and AC lines O-rings at the compressor. 22940 mi Gear selector sensor not reporting that the vehicle was placed in park. 3655 mi Traction Contrel System engaged while on dry pavement. I was unable to disengage TCS. Engine reving high as a result of TCR. Brought to dealer to see RCA. Results inconclusive. Dealer updated ECU and Antilock firware to latest rev. Traction Contrel System engaged while on dry pavement. I was unable to disengage TCS. Engine reving high as a result of TCR. Brought to dealer to see RCA. Results inconclusive. Dealer updated ECU and Antilock firware to latest rev. US $570 Car wouldn't recognize when it was in Park, so it wouldn't fully shut off. Dealer replaced shifter assembly, 100% out of pocket expense. Well known problem among ford auto shifters. Really should be a recall issue, honestly. US $665 Moon roof stopped working 1 month after warranty expired.Replaced 1 of the motors and switch. The shade had still worked. Labor was $430. Job took less than 3 hours. 30000 mi Moonroof again stopped working, but dealer fixed at no cost because previous repair on moonroof had 2 year warranty. 20000 mi Defect in arm, replaced Headliner rattle Seat belt not locking Clip loose in passenger door - removed and replaced Rubber door seals worn through. Noise while steering - Clock spring ordered but not yet replaced Rattle above the third row rear speaker. 48000 mi Stabilizer bar became lose and had to be replaced. Faint burning smell in car if engine exceeds 4000 RPM. Dealer are unable to find the cause. Replaced cabin filters. Problem ongoing. 55180 mi Battery died under warranty. Shop I bought the battery from agreed to replace free of charge. Battery was 11 months old. But after jump starting the car just to get home and had the new battery delivered and installed. Upon starting there were multiple warning related to brake and traction control system. Shop does not want to claim responsibility. I was forced to buy an OBD2 cable and FORscan in an attempt to clear the faults but as of today 15/07/2018, fault lights are still on. 1500 mi Brand new vehicle and air conditioner was't cooling the vehicle appropriately. Dealer evaluated and determined below standard. Evacuated and recharged coolant. US $160 Replaced rear brake rotors and pads. US $350 Replaced front and rear brake rotors and pads. 32240 mi Front and rear brakes serviced. Vehicle was making high pitched whining noise when releasing brakes. Pads determined to be sticking in 2 of 4 wheels. All brakes serviced and lubed under warranty. 36580 mi Third row seatback cracked right through. Leather separated from one third row headrest. Driver's side door panel replaced (2cm crack on leather). All covered under warranty. C $100 AC compressor clutch disintegrated and was nowhere to be found in engine bay. AC compressor replaced using Ford Extended Warranty. $100 is for deductible. Car had less than 75000km when this occurred. Ford not sure why part failed. 48360 mi Transfer case seal started leaking less than 2 weeks after car had its AC compressor replaced by the dealer. Covered by vehicle powertrain warranty. Cabin was filling with smoke as fluid dripped on the hot cat below the transfer case!!!!! US $500 Shocks were making a squeaking noise when turning. US $61 Replaced hub assembly with a new one because the original was grinding. Replaced spark plugs due to misfire. Also replaced intake gasket and pcv valve. Had to remove the upper intake to get to rear plugs so decided to replace the gasket and pcv valve as a preventative measure. See our lemon odds and nada odds page to see vehicles with no repairs or vehicles with more than three repairs. To see how frequently 2013 Ford Explorer problems occur, check out our car reliability stats.